In the 2007 first year amateur player draft, looking at a loaded slate of talent, the Marlins did not know where to start while adding to their already prospect-heavy team. In the first round, Florida picked third baseman Matt Dominguez from Chatsworth High School in California. Three years later Dominguez joined the big league squad in Jupiter for spring camp, and in 2011 he was a September call-up of the Fish. Last year, Matt was finally called up to the big league squad. He had 45 at bats in 17 games. He hit .244 and managed a .292 on-base percentage. I saw him play on September 16 at Nationals Park, and for the second time I thought he was the future third baseman of the Miami Marlins, as the Marlins had not had a sure third baseman since Miguel Cabrera’s 2007 departure. On no fault of his own, that window of opportunity was soon closed shut when the Miami signed Jose Reyes this past offseason, and announced that Hanley Ramirez would switch to third base. Dominguez is a career third baseman, and his options then seemed minimal. The Marlins’ front office had a decision to make regarding the future of Matt Dominguez. He could be a season in the bigs away from becoming the next Mike Lowell or Ryan Zimmerman, but he will not be able to get in that season while backing up Hanley Ramirez. So on Sunday, the Marlins optioned Dominguez to Triple-A New Orleans where he hit .258 a season ago. Who knows; with Hanley Ramirez’s recent proneness to injury, Matt might get a shot a starting for a few weeks this season. Many argue that the Marlins should not have even drafted Dominguez, who was extremely well regarded in the 2007 draft, but has not yet lived up to the hype. The biggest reason why his draft to Florida seems like a flop is this: Florida’s second round pick in 2007 was a slugger now known as Mike Stanton. Also, at the time the Marlins drafted Stanton, Jason Heyward was on the board as well. Imagine if Florida’s scouts had had the clairvoyance to draft Mike Stanton in the first round, and Heyward in the second. That situation may have been better for Dominguez, who could flourish in another organization. 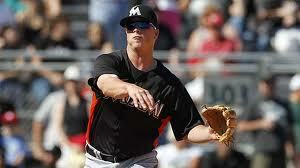 The Marlins; however, have not expressed interest in trading him.